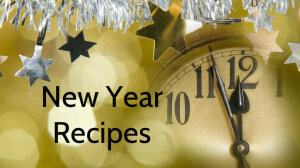 ½ litre of bechamel – Today you can find prepared bechamel in your local food shops. ( a tip from Aunt Mirella )– she never made bechamel from scratch as it took too long and she found the prepared ones excellent! Follow the instructions on the packet to heat the” Vol au Vent”. Put the finely chopped mushrooms (if you are using dried mushrooms, it’s better to soak them a little first in boiling water with a pinch of salt and pepper – do remember to drain the excess water out ) into a pan with the nob of butter and the garlic clove – after a while take out the garlic, just a little flavour is enough. Add the frozen peas and cook until the peas are tender. Now add the bechamel and the parmesan cheese. 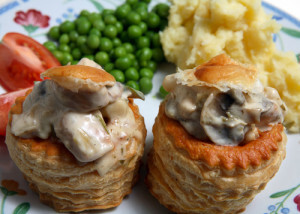 Fill the prepared Vol au Vents and keep them hot in the oven. They are also nice cold and you can serve them either as appetisers or as a first course.